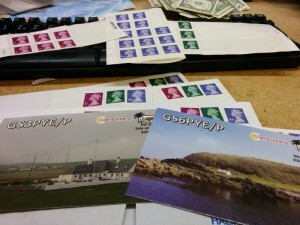 Throughout the week, Geoff G0DDX has been busy activating many of the Worked All Britain (WAB) squares around Islay. 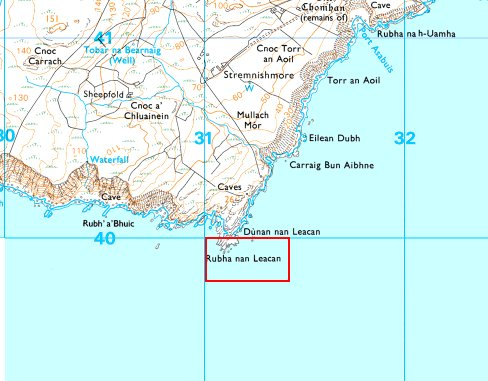 These are the 10*10km squares on the Ordnance Survey mapping system covering the UK. Some squares are easy to reach – GS3PYE/P is in NR36, for example. Others require driving along some more exciting roads and farm tracks, and Geoff has activated many of these, and continues to do so. 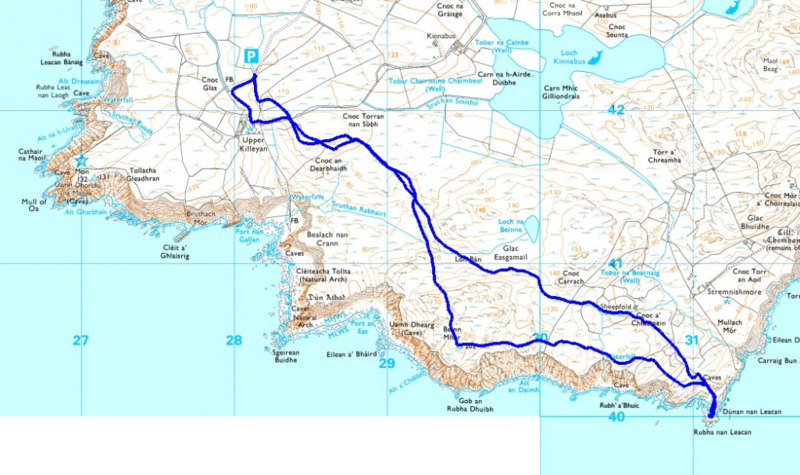 With the nearest road about 4km away, and and with only a few square metres of dry land (none at the highest tides! 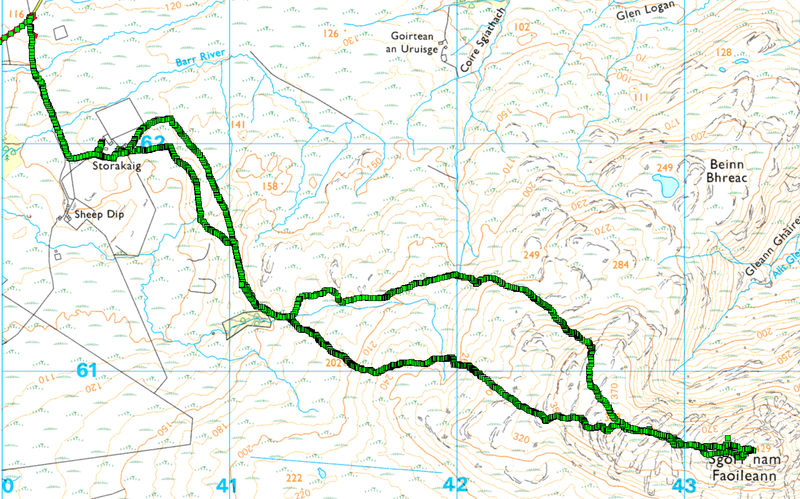 ), it needed a fair walk in through the scrub, with not even a footpath to follow. Challenged by Voi G0BOE back home in Cambridge, Colin G4ERO, Dom M0BLF and Rob M0VFC decided to activated the square yesterday – assuming we could get to it, which wasn’t a certainty! The VHF station has been running well since the day we arrived. 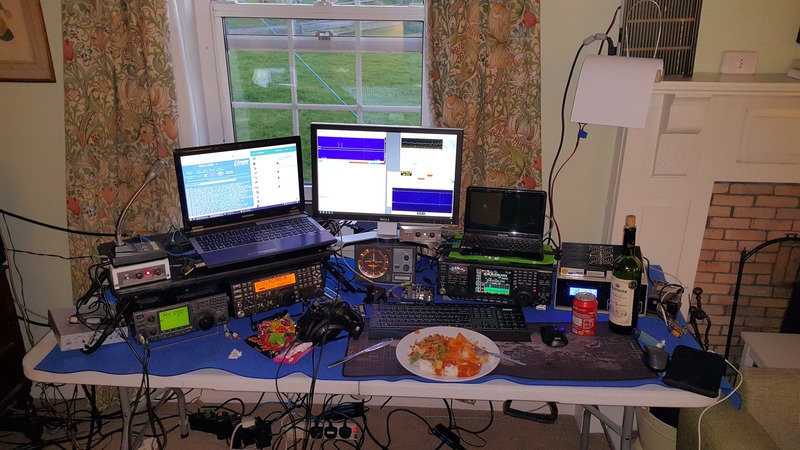 It was setup and making QSO’s by 19:00z on Saturday. As usual, the Camb-Hams trailer mast has been used for the VHF antennas. The G1000 rotator is in a cage this year to help reduce the strain on it, especially when lidting to the vertical position. 4m and 2m are fed by LBC-400 coax, and 6m is using H2020 coax. To work 3 stations there is a need for 2 laptops + a 21” monitor, The monitor allows 2 MSHV windows (2m + 6m) to be shown side-by side, with the main laptop display to be used for KST chat and other computer activities. The 3rd MSHV (4M) window is running on the netbook (above the Pro3). 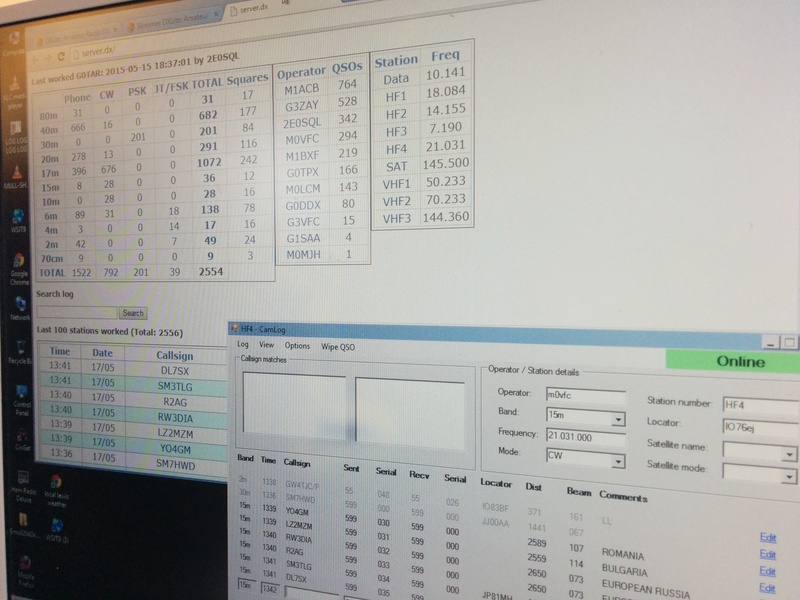 At the time of writing this, on VHF we have made 96 QSOs; 42 on 6m, 14 on 4m and 40 on 2m, including 16 on 2m EME. And we’re on the way home. 10,299 QSOs in the log after a final session on 40m last night. 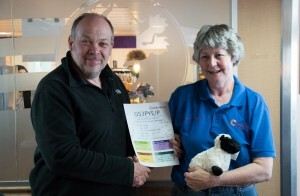 After breakfast on the ferry, the now-traditional awarding of a stuffed sheep this year went to Linda, G0TPX, for her fantastic patience in making over 500 QSOs this year. The animal in question got an upgrade this year, and has been named Baaabara. “Little Flossie”, the previous mascot, will go to Steve M1ACB for making the most QSOs. 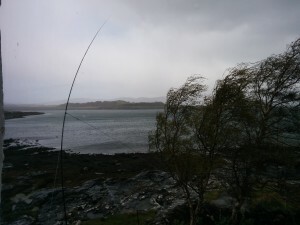 Despite some pretty nasty weather at times, the only antenna casualty was one section of fibreglass pole. The repaired KPA500 continued working well to the end, and all other radio gear performed well throughout. 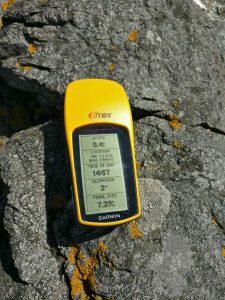 Congratulations to F5IAE for the most QSOs in the log at 14 (over 7 bands), followed shortly by M3JFM, OK2PAY and SP9FKQ at 9 QSOs each. It’s nearly the end of the week for us, and almost everything is now packed away – just leaving a single station on 40m for this evening. We hit the magic 10,000 QSO mark earlier this afternoon after a bit of a race between myself (M0VFC) and Martin G3ZAY on 20m and 17m CW, matching each other almost QSO-for-QSO. We eventually called a truce at 1,850 QSOs each. 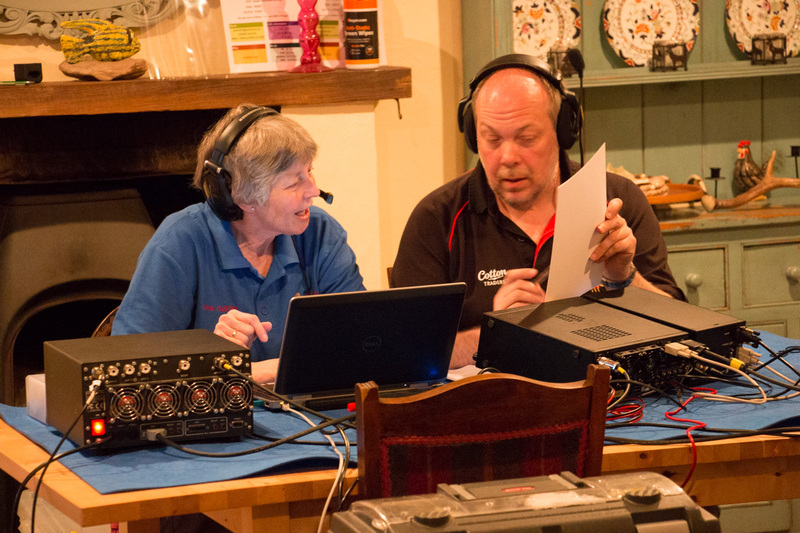 However, Steve M1ACB holds first place with 2,235 QSOs – clearly keen to keep his hands on the fluffy sheep that rewards the operator making the most contacts in the week! Thanks to everyone who called us over the week. We’ve had a fantastic time, and hopefully you’ve enjoyed working us as well, whether on one band or many. 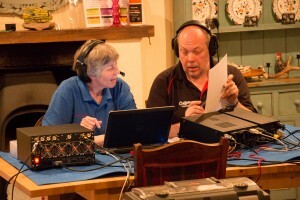 Congratulations to F5IAE for working us on seven bands: 6m, 15m, 17m, 20m, 30m, 40m and 80m. Managing six bands were: PE1RLF, SP9FKQ, VO1SA and OK2PAY. Tomorrow morning we start the journey back to JO02 square, where we can all start rebuilding our respective shacks, having emptied them for this week! A little excitement earlier today when the indoor shack (i.e. the thing we’ve turned the dining room into!) 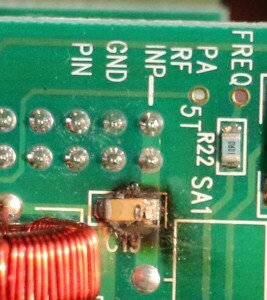 started smelling of expired components. 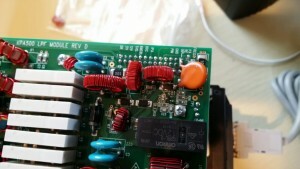 After investigation, it turned out to be from G1SAA’s Elecraft KPA500 amplifier, and after disassembly we spotted the source – a surface-mount capacitor on the input to the low pass filter board. Thankfully after a quick email to Elecraft support, we found the value of the capacitor, and a quick email to Roger GM4PMK who lives on the island, we had a replacement part which Gavin M1BXF fitted – and the amp lives again! Thanks very much to Roger for the part and Craig at Elecraft for his swift reply and help. We’ve now been on air for about three days, and the QSO count stands at a satisfying 5,500. Everything up to 2015-05-18 1629 UTC has been uploaded to Club Log and LoTW, and we’ll continue with regular uploads throughout the week. We now have the full compliment of HF bands available to us thanks to a 12m vertical dipole, and the satellite antennas are up, so we have the first QSOs in the log from some of those passes. 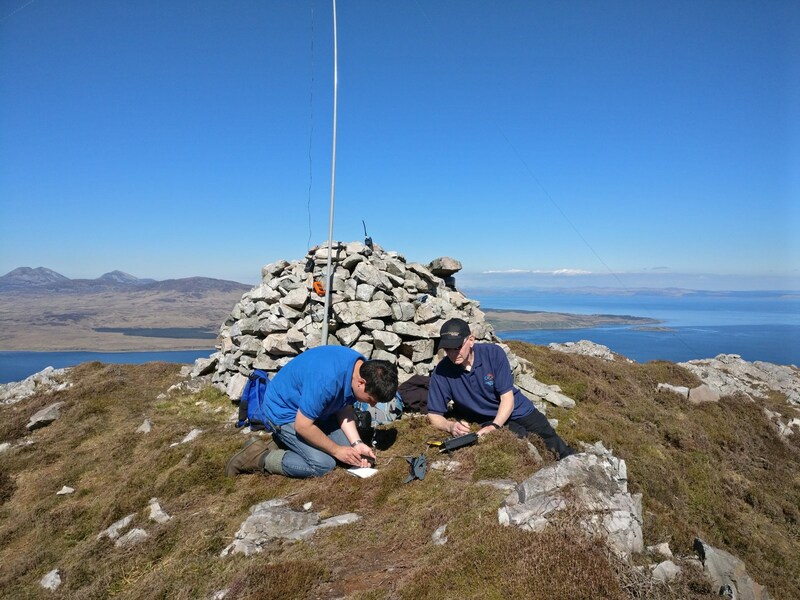 The highest HF bands (10 and 12m) have been relatively quiet so far here, so we’ve been concentrating on CW on them until propagation supports SSB. If you’re looking for us on those bands, it’s worth checking the Reverse Beacon Network for CW. 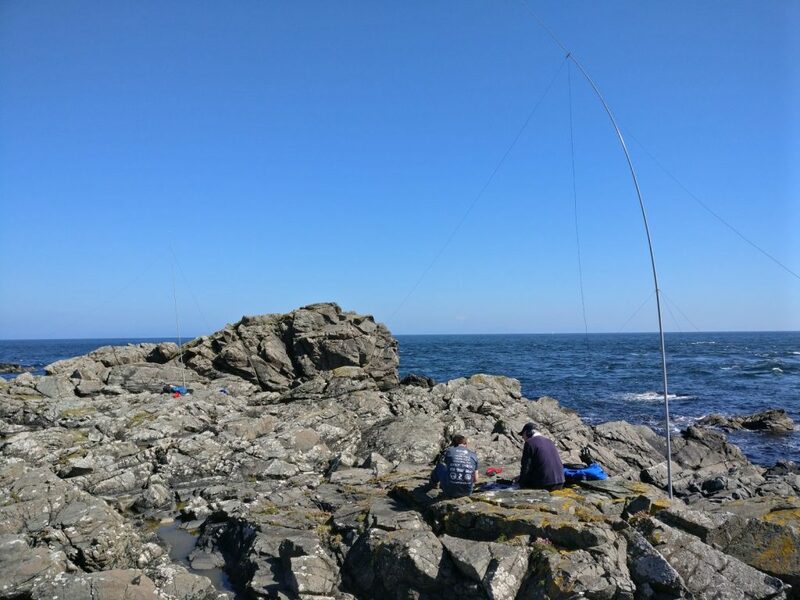 We’ve had some positive comments about our signals, and here having vertical antennas right next to the sea certainly helps -as you can see from the photo, the radials from the 40m 1/4 wave vertical (closest to the camera) are actually under water at high tide. Moving back, there’s 17m and 20m, with 12m in the distance. 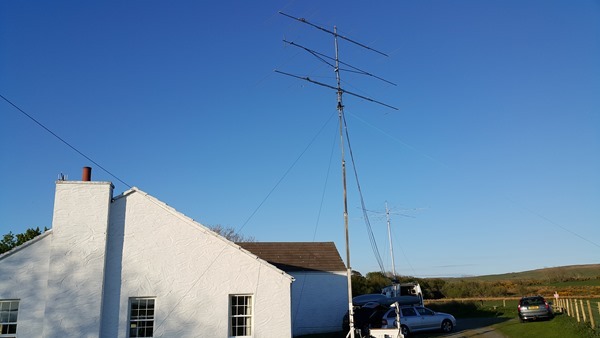 We’ve put up some more antennas, including 10m and 15m rotary dipoles and an inverted-V for 80m, so we’re now operational on all our planned bands except 12m, where we plan a vertical dipole. 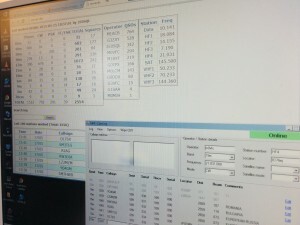 The QSO total currently stands at around 2,700, and all QSOs up to 1327 UTC today (Sunday) are now uploaded to both Club Log and LoTW. We’ll continue uploading periodically as internet access allows. 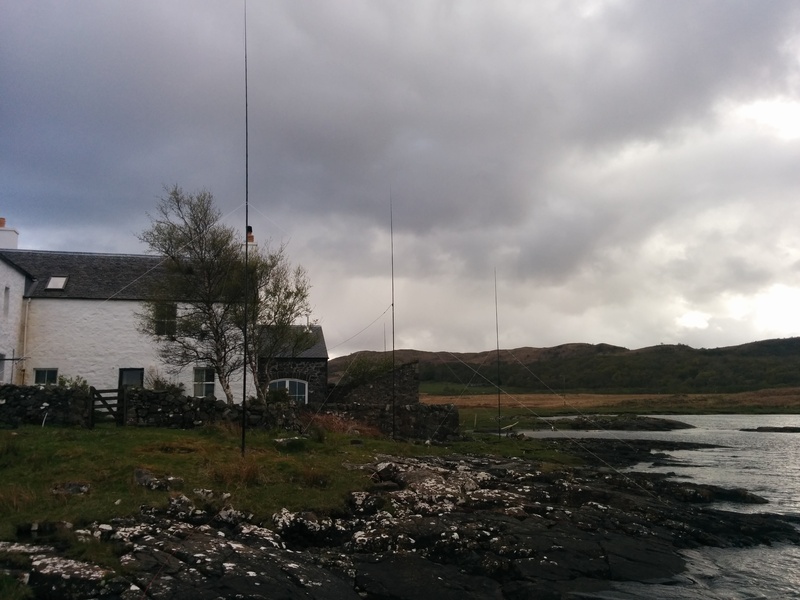 We’ve now been on Mull for nearly 24 hours, and the stations are starting to come together, with over 700 QSOs in the log so far, including 67 on VHF thanks to some Es last night. That still leaves quite a few to build – the Spiderbeam for 10/15/20m, the satellite antennas, and 80m vertical. On 2m, we’ve decided to remove the elevation system as it added a lot of weight at the top of the mast, and instead mount the 17-ele Tonna for azimuth rotation only. Hopefully this will still allow some EME operation at moonrise and moonset, as well as tropo QSOs. Casualties so far: one 10m fibreglass pole, and lots of dry clothing! 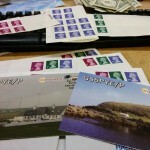 This year, we’re making some changes to the way we handle QSL cards. If you requested a direct card in 2014, you may have found it took longer than normal to get a reply – entirely my (M0VFC’s) fault, after a year of trying to do too much in not enough time! Hopefully you will have received your card by now, but if not, let me know by email (see QRZ.com) and I will check the log to make sure your card has been sent. My apologies for keeping some of you waiting for so long, and thank you for your patience. To avoid these delays happening again this year, we would like all QSL requests to use OQRS (online QSL request system). As before, this will be using Club Log, and logs will be uploaded regularly. This applies to both direct (£1.50 – about $2.40) and bureau (free) requests. It’s cheaper for you: you don’t have to use one of your own cards, or envelopes, or postage to us – only the return postage. It’s faster for you: your card doesn’t have to get to us before we can reply. This is particularly important for bureau requests! It’s faster for us: instead of opening each envelope, typing in and checking QSO details, we can print all the labels instantly. This means we can get your card back to you faster. It’s cheaper for everyone using the bureau: because you don’t need to send us your card, it halves the amount of cards that the bureau needs to sort. We realise in a few countries, PayPal is not available, so if you really cannot use OQRS, cards sent direct to M0VFC will still receive a reply, but OQRS requests will be processed first. If you have requested a card using OQRS, do not send us your paper card as well – we do not collect them! Consider whether you really need every QSO confirmed, or whether only some would be enough. 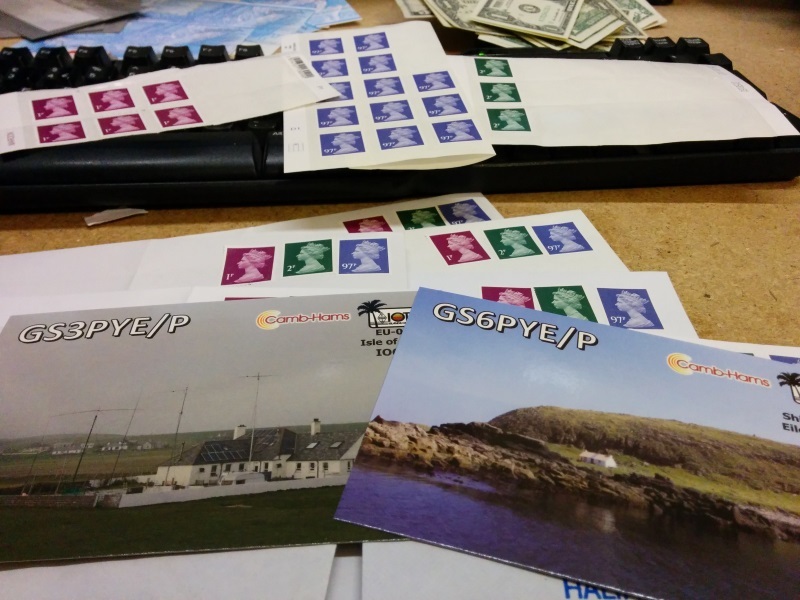 We are, of course, very happy to send QSL cards to those who want them, or need them for an award, but also wish to reduce the amount of waste currently in the system.